"We had a brilliant turn out of 36 dogs entered though out the whole weekend. We started on the Saturday with the Section E entrant, Ruby Hill, she sailed though with no problems passing with a very high score. 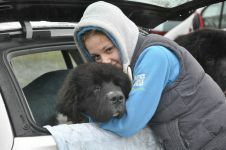 Following on from Section E, we started Section C with 8 dogs entered, but sadly only 2 dogs passed. 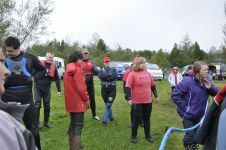 Fortunately out of 11 dogs for level A only one failed, by this time we had to stop for the day, as although the sun was still shinning the temperature had dropped and it was becoming too cold for all those in the water for a prolonged time. Discouragingly Sunday didn't start as well as hoped as the rain had started and didn't let up through out the day. 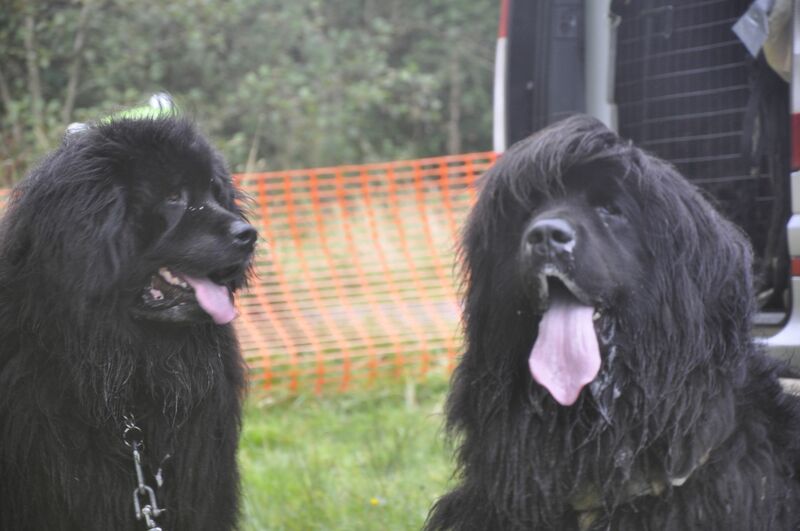 Unluckily all four dogs entered in Section D failed, but 8 out of the 12 dogs entered in Section B passed. I would like to say a big thank you to all of the stewards who made the weekend run so smoothly, to all those who entered and to those few who did the food and hot tea and coffee which was greatly appreciated through the course of the weekend (especially in the cold rain!!)." Viney's Evanpark Rocket Man to Millthorpe "Badger"
"With the sun shining the venue was first class, which nearly matched the hospitality you always get here. Working with Mick Reilly is always a pleasure. The standard of 'A' entries was to a good level and I look forward to being asked to judge again. I would like to add the standard of the stewards and their hard work which sometimes goes unnoticed was also very good, these are the people who make our job easier. Thank you." Thornton's Applebank Lucky Star "Moby"
"8 dogs entered into section C today. 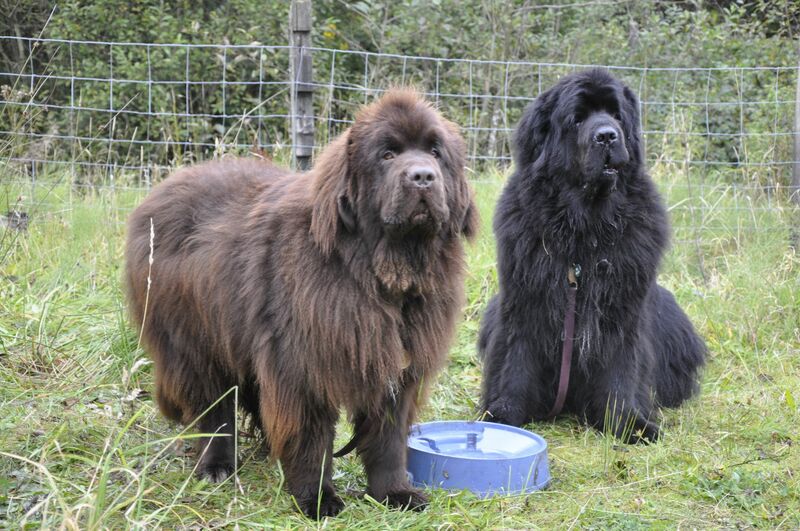 2 dogs passed - well done Moby and Maia, 6 dogs not quite ready yet. A few entrants didn't get out of the boat in time but then completed the rest of the test well. 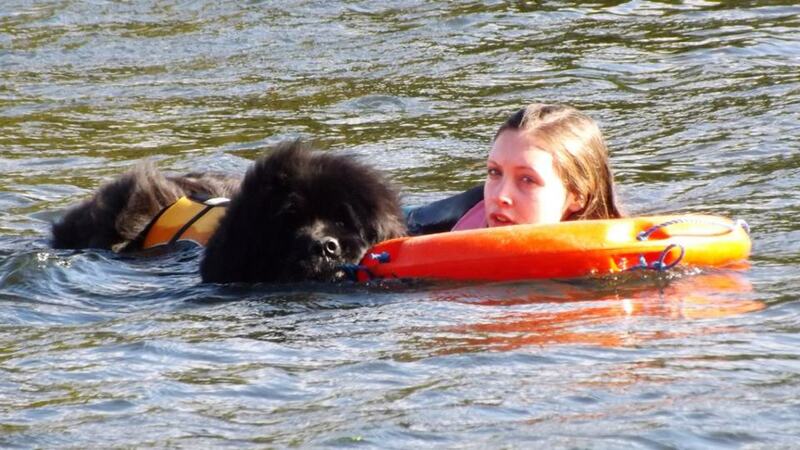 The stranger seemed to be a problem for all the dogs who didn't pass which was a shame as the stewards tried so hard to encourage a tow back to shore. Some of them got there eventually but were out of points. The slight wind made the retrieve a challenge for all the dogs today with only 4 dogs actually bringing the ring back and passing the element. The standard of the controlled swims was excellent today, this element of the test shows a great deal of dedication and trust within the team, it was a pleasure to see such high standards from one of the harder elements. Huge thanks to the stewards and boat handler who worked really well for the tests. As always the WNAG team made us feel really welcome and put on a great event, it's always a pleasure to be invited to this beautiful venue, they have a great team of people who work so hard to make these events possible." Hill's Sandbears Lady Guinevere For Ableseanewf "Amelia"
Wedlake's Sandbears Strike It Lucky for Sealake "Tirion"
"A chilly day with overcast skies and drizzle on and off all day did nothing to dampen the enthusiasm of the dogs and handlers and there was a great atmosphere with everyone cheerful and happy to be with their dogs and friends ... just as it should be. We had 12 entrants and a very creditable eight teams that passed and of those that didn't quite achieve the standard most came very close indeed. 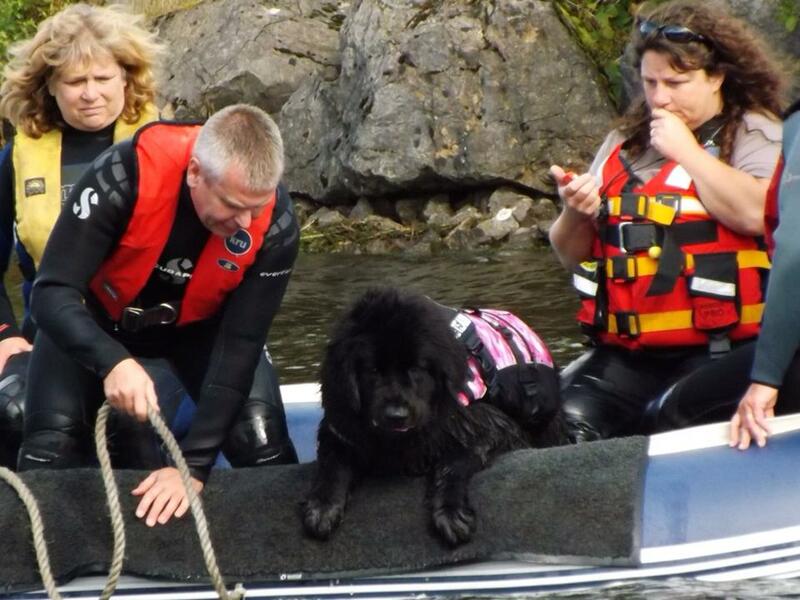 The first three exercises were exemplary in many cases with only two rump tows being used in B1, nice to see the rope being readily taken and held all the way back with the weight of the boat and occupants presenting no strain on these fit Newfoundlands. 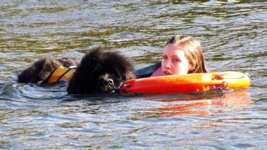 The B4 underwater retrieve didn't present problems for most of the dogs although we had a few that made it quite exciting in the process with a will-they-won't-they right down to the wire. It was typically B5, the Controlled Swim which was the stumbling block for those that weren't successful. 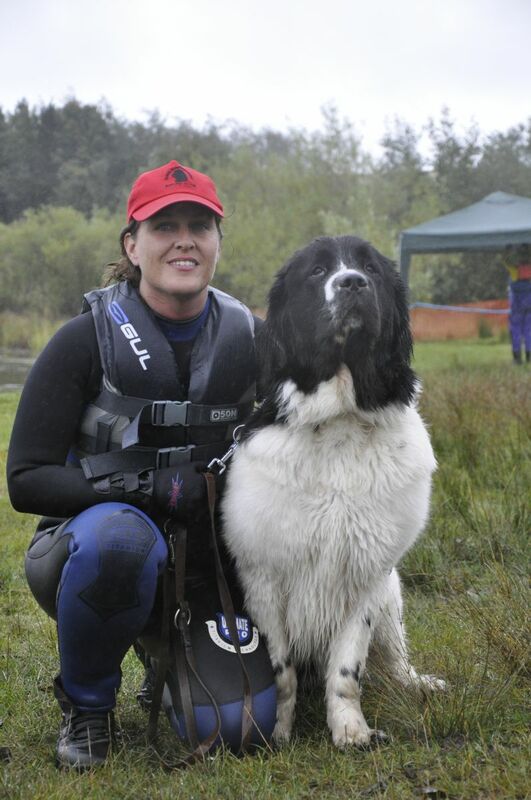 In some cases the handlers weren't the dogs owner or normal partner and it is big ask for novice dogs to do a safe swim under those circumstances, in fact there are probably very few experienced dogs that could be relied upon to perform a controlled swim under test conditions with someone other than their owner or regular handler. 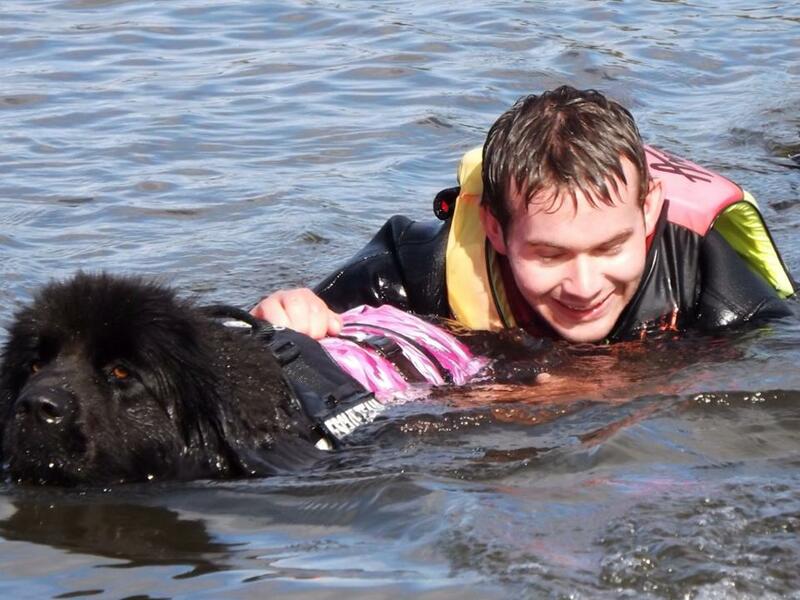 If at all possible give your dog the best chance of passing this exercise by swimming with them on a regular basis and in the test. 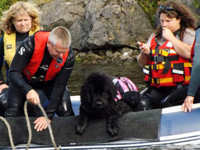 If keeping up with the dog is a problem, the test regulations do permit the use of webbed gloves and they can add a surprising amount to swimming speed. My thanks to my co-judge, Mick Reilly who happily shared his experience and knowledge and was a good mentor. 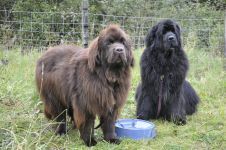 Thanks too to all of the members of the Welsh Newfoundland Activity Group who hosted the event, provided an efficient team of stewards and generous hospitality. 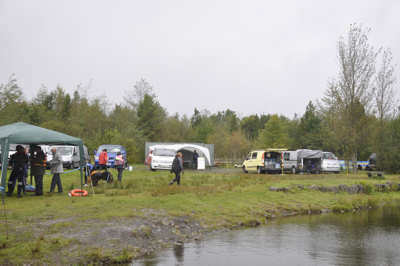 I enjoyed the day very much and look forward to my next visit to Bryn Bach." "Always a pleasure to judge at this venue, although the weather was it's usual unpredictable self, the stewards willingness to help and be guided at times is a credit to the organisational skills of this group. Sadly today none of the dogs entered reached the required standard, some had a long way to go with their training before they will pass, perhaps the dogs will benefit from multi passes at Section C early next season before attempting this level again. Look forward to seing these dogs progress in the future, hopefully passing at this level and also Section E.
Thank you WNAG for your warm hospitality and my giant toblerone."